When you think of designing anything with a mechanical function, the tool that best comes to mind is Solidworks. Its an industry standard among engineers for designing everything from toasters to satellites - and for good reason - it turns the task of modeling precise geometry into a nearly infantile process. Want to connect this cylinder to this cube? Simply drag them together and wala -you now have a merged surface with zero artifacts. No, this is because Solidworks uses what is known as NURBS surfaces, ( or non uniform rational b splines)..the advantage being there's no complicated memory eating math for the computer to have to calculate surface connections such as with polygons and their infinite number of vertices - it just works, and beautifully so. You could build an entire fighter jet down to the bolts and use a tenth of the memory of say a high polygon 'hero' character creature used in a movie production. Thats because a creature for a movie is meant to look beautiful and photo real (organic shapes need insane amounts of polygons), not have a practical simply expressed mechanical function. But what is an engineer to do if the surface they are building their bridge on requires not just say 4 angles, but 10,000's of angles which should sit flush on contact? Enter the world of designing a custom fitting shape that will fit a person's unique bone anatomy. So then what to use? The incredibly complex and irregular shape of a persons bone surface (imagine handing a lego to an engineer and just before telling them to build a lego to perfectly fit it, crushing and deforming it in your hand) requires the most precise of contact with an implant to provide the utmost support and bio-compatibility to deal with the stresses that come from every day bite forces. Thats the challenge of designing a custom fitting implant but thankfully the tools for creating this type of high detail shape are standard fare in the Entertainment industry. Programs like Z-Brush for example can handle an Inter Oral Scan from a patient (which has millions of polygons) with ease but would be impossible to use inside of Solidworks. From inside Z-brush, all the functions that engineers are used to using (such as Boolean) have all been designed for artists to work with super high poly geometry. 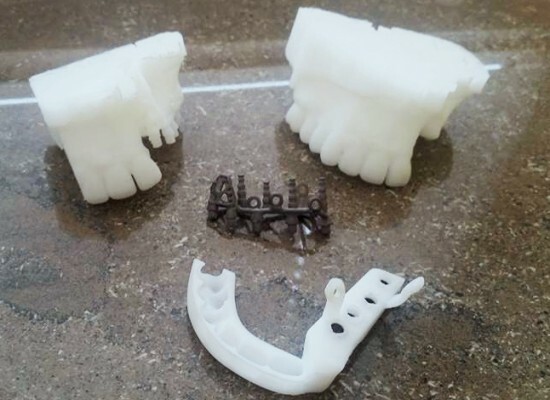 Not only that, but Z-brush is already designed to work in a 3d printing production pipeline (thanks again to the movie industry), and is extremely easy to learn for anyone with proficient knowledge of 3d applications. Beyond Zbrush, there are other non traditional mechanical design tools which provide other great advantages to the high polygon implant design process such as Maya and or even more powerful, Houdini. Thanks to the ability of a 3d printer to print almost any possible shape imaginable, no 3d design software or 3d artist can be ignored in the future of engineering because at the end of the day, the results speak for themselves.